Watch: Days after US unveiled J'lem embassy, Guatemala returns its embassy to Israeli capital. Just two days after the US relocated its embassy from Tel Aviv to Jerusalem, the Central American nation of Guatemala is set to unveil its new Jerusalem embassy on Wednesday. 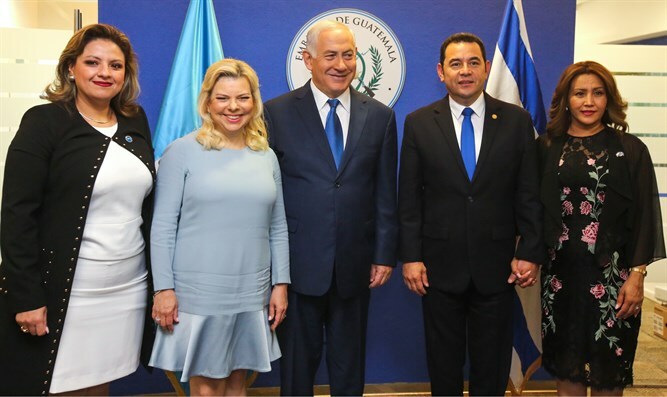 Guatemala’s President Jimmy Morales and Israeli Prime Minister Binyamin Netanyahu both took part in the opening ceremony Wednesday morning in south Jerusalem’s Malha Technology Park. The two leaders are expected to meet at the Prime Minister’s residence following the embassy opening. In an address marking the embassy opening, Morales said Israel was a “light unto the nations”, and highlighted his country’s close ties with Israel. “This is the beginning of a historic day for the Israel-Guatemalan friendship,” said Morales. "You are the second country to recognize Israel," Prime Minister Netanyahu said in a speech during the embassy unveiling ceremony, "but you had a very important role in this because your Ambassador to the United Nations Jorge Granados was very active in lobbying the countries at the UN at the time to support the Partition Resolution, which was effectively the recognition of the Jewish state by the United Nations." "In his honor and the honor of Guatemala's efforts in those days there's a Guatemala street right here, right here, it's about a kilometer from here in Jerusalem. There's a Guatemala street in many cities and many communities in Israel because we remember our friends, and Guatemala is our friend then and now." On Tuesday night, the Jerusalem municipality illuminated the walls of the Old City of Jerusalem with Guatemalan flags in honor of the move. "Guatemalan Embassy, welcome home,” said Jerusalem’s Mayor, Nir Barkat. “Ahead of the inauguration of the embassy, we have illuminated the walls of the Old City with the flags of Guatemala and Israel. I thank President Jimmy Morales Cabrera of Guatemala for his courageous decision and am honored that we will be opening the embassy in the capital of Israel tomorrow. I call upon other countries to join the United States and Guatemala - do the right thing and bring your embassies to the Jerusalem, our eternal capital!" Unlike the US, Guatemala originally located its embassy in Jerusalem. In 1959, Guatemala made history as the first nation to recognize Jerusalem as Israel’s capital with the presence of an embassy. Forty years ago, however, then-President Kjell Eugenio Laugerud García moved the embassy to Tel Aviv. Following President Donald Trump’s December 6th declaration recognizing Jerusalem and vowing to relocate the embassy, however, Guatemalan President Jimmy Morales committed to following suit, pledging to back the US move in the UN and to relocate his own country’s embassy. When the United Nations General Assembly vote to reprimand the US for the embassy move in December, Guatemala was one of just nine nations, including the US and Israel, that opposed the resolution.